Photos are a great way to share your best memories with the people you love. With our wide variety of templates, you can create your own greetings to send out to friends and family throughout the year. Include photos, personalized text, and even your own artwork to make your greetings picture-perfect! If you’re looking for even more options, we offer both a double sided cardstock and folded photo cards that can be designed for any occasion. You can print photos on cardstock for formal announcements and announcements. Using our convenient project editor, you can build the perfect photo card in no time and include your own picture and message for a truly personalized feel. Whether you’re creating wedding invitation cards, custom save the dates or personalized thank you notes, we have a wide variety of designer card layouts to choose from for any occasion. Begin your card project by uploading your photo to your Winkflash photo folder for easy access. After you have uploaded your photo, choose your card size and orientation. Then, select from our wide variety of templates that are tailored to dozens of occasions perfect for any card. Afterwards, drop your photos onto your selected layout and add your own message using our text feature. Once you review your card layout, simply add it to the cart and proceed with your order. After your classic photo cards arrive in the mail, send them out to your loved ones and share your love with a heartwarming greeting and a beloved photo. Our photo paper cards are guaranteed to make a lasting impression, no matter the occasion. Whether it’s a senior portrait or your favorite high school moments, you can use your best photos to create high school graduation announcements that are brimming with personality! Choose from a wide range of card templates and simply add photos and text to complete your layout! You can create custom cards to go with your personalized graduation gift or make your own photo graduation invitations to keep your loved ones apprised of your ceremony’s time, date, and location. Our glossy photo paper cards are available in a range of templates that you can personalize with photos and text. 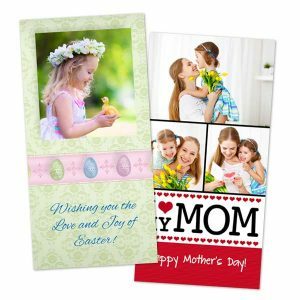 Choose from multiple Mothers Day cards and fill them up with Mom’s favorite memories! You can also include a personalized message using our text feature. We make photo card printing easy no matter the occasion. For personalized Mother’s Day greeting, Winkflash has you covered. After Mother’s Day come Father’s Day in June. We haven’t forgotten about Dad though. Select a Fathers Day photo card template that compliments his style and add his favorite photos. Our glossy photo cards are printed on the best quality photo paper to bring out the best color so your selected pictures will look their best. Then, add your own personal message! When you’re tired of the same old cards from the neighborhood drug store, Winkflash has everything you need to create your own and make Dad’s day all the more special! Now that you’ve create your card, it’s time to think about photo gifts for Dad. We have photo books for Fathers Day, custom canvas prints, personalized office accessories, and more! If you’re in the midst of making plans for the big day, it’s time to start to start thinking about cards. Design your own photo wedding invitations and wedding thank you cards with our many wedding themed templates. A favorite engagement photo or picture from a couples photo shoot would make a great addition to your save the date wedding cards or wedding thank you notes. Go formal or contemporary with our many designer inspired templates that are sure to bring an air of sophistication to your wedding correspondences. If you’re thinking about creating your own custom photo cards for your save the dates, then look no further than Winkflash! Save the dates are ideal for a whole range of events including bridal showers, weddings, baby showers, holiday parties and so much more! Our custom save the date invitations come in whole range of photo layouts so you can use your treasured photos to create the ultimate card your friends and family will love. Whether you want to show your gratitude for a gift from a loved one or simply a kind gesture from a friend; it’s always a good idea to send out a little thank you note. Custom thank you cards make your greeting all the more special. Take one of your favorite photos. Whether it’s a stunning landscape picture you took while on vacation or a beautiful family portrait, you can design the perfect thank you that adds a personal touch to your sentiment. You can even use our custom card maker to add your own text. Our custom photo cards can be designed and customized so you can send out your own greetings that compliment your personality. 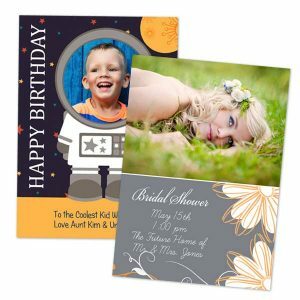 Whether you’re throwing a birthday bash, sending out greetings during the holiday season or recently had a baby, we have dozens and dozens of customized options to create the perfect greeting card, invitation or announcement. Simply upload your photo to Winkflash and choose a template that’s just right for you. Once they arrive, you can include your own handwritten message on the back of your glossy photographic paper card and send it out to your loved ones. Whether your event or party is formal or casual or you just want to keep in touch with everyone in your life, we have the perfect photo card just for you, no matter the occasion.